Twenty years ago today Jorge Luis Borges died in Geneva at age 86. His longtime companion María Kodama was by his side. Borges and Kodama had been married just three months prior, though they had known each other for almost twenty years. Borges knew the end was near and chose to die in Geneva, where he had lived in his teen years. 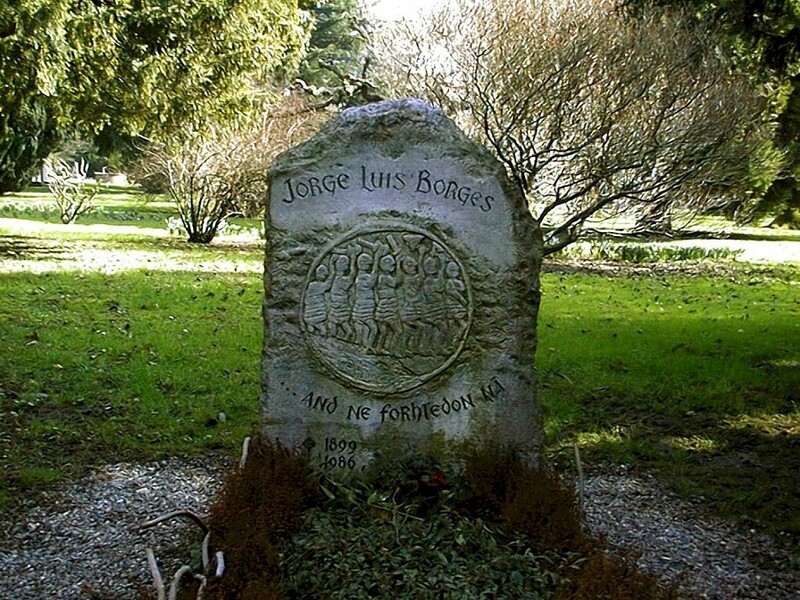 Borges is buried in a simple grave at the CimetiÃ¨re de Plainpalais in Geneva, a far cry from the opulent tombs of Recoleta Cemetery in Buenos Aires where his mother and sister are buried. His tombstone in Geneva has Anglo-Saxon imagery and a quotation from the Old English poem “The Battle of Maldon”: “and ne forhtedon ná”, and be not afraid. In reference to: “Every one of us is, in some way, all the people who have died before us.” I would like to say that it is the “Semiosis ilimita” (Ilimit Semiosis?). Is there any place in Web where I can find this lecture of Borges? As far as I know, it’s only available in print.